The 8th Ice and Snow World opened to visitors in <?xml:namespace prefix = st1 ns = "urn:schemas-microsoft-com:office:smarttags" />Harbin, northeast China's Heilongjiang Province, on January 5 and continues until February 25. More than 2000 ice sculptures are on display at the annual event. 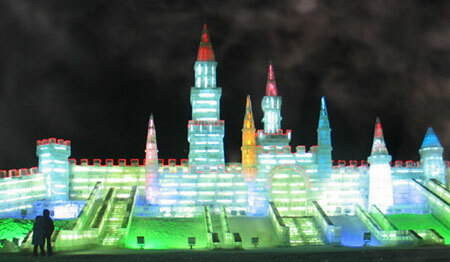 The Harbin Ice Festival, established in 1985, is held annually from January 5 and lasts for over one month. This is China's greatest ice artwork festival and attracts hundreds of thousands of local and overseas visitors. The city's location in northeast China accounts for its arctic climate which provides abundant ice and snow. 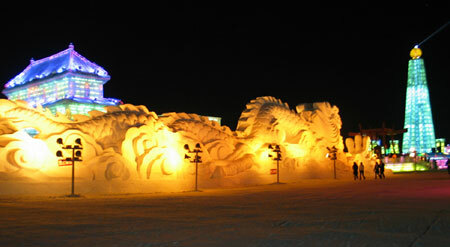 The 'Ice City' of Harbin is recognized as home to ice and snow art in China and is famous for its exquisite sculptures. The fabulous Ice Lantern Festival was the forerunner of the current event and is still perhaps the best loved part of the festival in the opinion of those who come to Harbin annually. Admission Fee: 30 yuan for adults and 15 yuan for kids (extra 50 yuan for the Snow Sculpture Art Exposition). The lowest temperature in Harbin's February is at -30 to -20 degrees Celsius, and nowaday digital camera can not work well there in such a cold weather. Be careful of your camera as well as yourself. Harbin is some 1250 km far from Beijing. Direct train, Z15 with soft sleeper service, is availabel at Beijing railway station, departing at 20:30 and arriving at 07:05 everyday. The price is 429 yuan. Besides, T71(08:30-20:29) and T47 (17:30-05:05) are slao optional trips. The first ice lanterns were a winter-time tradition in northeast China. During the Qing Dynasty (1644 - 1911) local peasants and fishermen often made and used ice lanterns as jack-lights during the winter months. At that time these were made simply by pouring water into a bucket that was put outside to freeze. It was then gently warmed before the water froze completely so that the bucket-shaped ice could be pulled out. A hole was made in the top and the water remaining inside poured out creating a hollow vessel. A candle was then placed inside resulting in a windproof lantern that gained great popularity in the Harbin region. From then on people made ice lanterns and put them outside their houses or gave them to children to play with during some of the traditional festivals. So the ice lantern began its long history of development. With changes and great advancement in techniques today one can marvel at the various delicate and artistic lanterns on display. Today ice lanterns in the broad sense refer to plastic, ice and snow as raw materials which combine ice art with colored lights and music. The patterns on ice lanterns include ice and snow sculptures, flowers, architecture and much more. 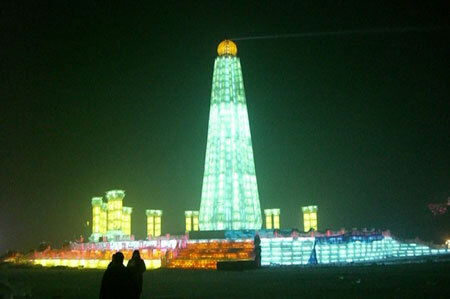 Harbin Ice Festival annually provides visitors with a whole new world of ice and snow. The most admired ice artworks are exhibited in three main areas: the Sun Island Park, Harbin Ice and Snow World and Zhaolin Park. The Sun Island Park is home to the Snow Sculpture Exposition which displays a wonderful world of snow. It has the world's largest indoor ice and snow art museum and it opens to the public from November every year. Harbin Ice and Snow World came into being in 1999 and is one of the world's largest ice architecture parks. The inspiration for the ice and snow sculptures is usually derived from traditional Chinese fairy tales or world famous structures such as the Great Wall and the Egyptian Pyramids. Zhaolin Park is a 'must see' during the Harbin Ice Festival as it has a traditional program that shows the best ice lanterns. 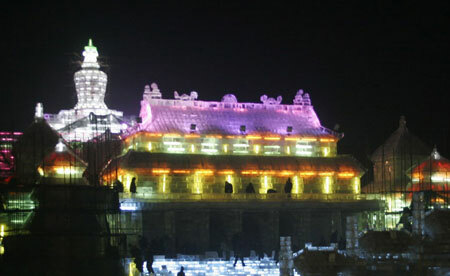 With water, lights and natural ice from the Songhua River as the materials used the ice lanterns are made by freezing water, piling up ice or snow and then carving and decorating them. 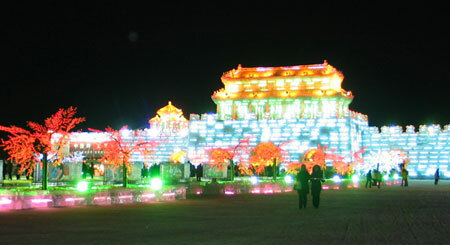 The ice lantern park touring activities have been held here annually since 1963 and is said to be one of the top 35 tourist attractions of China. There are numerous pieces of ice artwork in the park arranged in groups according to different themes depicting Chinese classic masterworks, European folk tales and customs. A great variety of objects such as buildings, gardens, flowers, waterfalls, European-styled churches, lions, tigers and dragons are carved from ice. In the daytime the ice sculptures are simply magnificent. And with the sparkling colored lights embedded in the sculptures coming on at night the park becomes a colorful and amazing world of ice. Harbin Ice Festival is not just an exposition of ice and snow art but also an annual cultural event for international exchange. Every year there are ice sculpture experts, artists and fans from America, Canada, Japan, Singapore, Russia China and many other countries. They participate in ice sculpting competitions and communicate with each other in the ice and snow world. Harbin ice lanterns have been exhibited in most of China's main cities as well as in many countries in Asia, Europe, North America, Africa and Oceania. For more than 40 years Harbin's ice and snow has been fully exploited to provide joy and fun for visitors to the city. During the festival many sporting competitions are also popular including ice-skating, sledding and the like. Weddings, parties and other entertainments are now very much a feature of this ice world. They make their own contribution to this great festival of art, culture, sports and tourism.